^ a b c d e f g h i j k l m n o p q r s t u v w x y z Toomas Hiio (2006). "Combat in Estonia in 1944". In Toomas Hiio; Meelis Maripuu; Indrek Paavle (eds.). Estonia 1940–1945: Reports of the Estonian International Commission for the Investigation of Crimes Against Humanity. Tallinn. pp. 1035–1094. ^ McTaggart, Pat (2003). "The Battle of Narva, 1944". In Command Magazine (ed.). Hitler's army: the evolution and structure of German forces. Cambridge, MA: Combined Books. pp. 294, 296, 297, 299, 302, 305, 307. ^ McTaggart, Pat (2003). "The Battle of Narva, 1944". In Command Magazine (ed.). Hitler's army: the evolution and structure of German forces. Cambridge, MA: Combined Books. p. 306. ^ Toomas Hiio & Peeter Kaasik (2006). "Estonian units in the Waffen-SS". In Toomas Hiio; Meelis Maripuu & Indrek Paavle (eds.). Estonia 1940–1945: Reports of the Estonian International Commission for the Investigation of Crimes Against Humanity. Tallinn. pp. 927–968. McTaggart, Pat (2003). 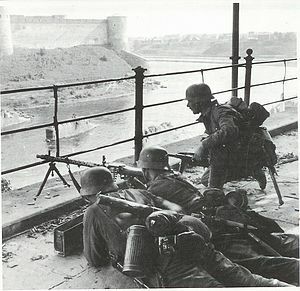 "The Battle of Narva, 1944". In Command Magazine (ed.). Hitler's Army: the evolution and structure of German forces. Cambridge, MA: Combined Books. pp. 287–308. ISBN 978-0306812606. This page was last edited on 16 April 2019, at 02:17 (UTC).